Incredible Greens was recently released, and so far it’s received favorable reviews, from both customers and media outlets. It’s been getting some publicity in the blogosphere, and here’s a quick recap of the coverage so far. I loved this stuff – it has a sweet aftertaste and not that earthy taste you’ve come to expect from wheat-grass concoctions. What I liked about it mixed with the water is that it wasn’t grainy. It mixed really smoothly, and I wouldn’t have been able to tell it was a power addition by drinking it. As in, it didn’t feel “piecy” in my mouth at all, I just felt like I was drinking a flavored water beverage. Remember the blueberry muffin shake I had recently? Its contained Incredible Greens! It was delicious. I have been a fan of Amazing Grass in the past, but I have to say that I would probably pick this one over it now. It has a more mild taste whereas Amazing Grass was more on the “grassy” side. I advise getting the majority of your nutrients through whole foods, but I also realize that that is just not always possible. Life gets busy, things get in the way. I understand. Incredible Greens is a great way to fix that problem and also ensure that you have your bases covered. I wrote before that Incredible Greens is unique in that it offers the best combination of nutrients and taste among superfood powders. I didn’t pay any of these people for their opinions, so you can consider this a little bit of outside validation. The retail price is $50, but keep in mind we’re more than happy to give generous discounts to 1st time buyers. Or you can get a bottle for free if you’d like to review it. As far as I know customers have been just as happy with it. 1). Working on ironing out wrinkles with International shipping. There have been a few hiccups, and about 30% of the readers on this blog live outside the US…..so it’s important. 3). Creating additional product sizes for Incredible Greens. This’ll probably mean reducing bottle size so people can try 5 and 15 day trial sizes at a lower cost. So far the biggest objection to buying is that people want a smaller size to try out to make sure they like it. Right now there isn’t, so it’d probably be a good idea to change that at some point in the future. 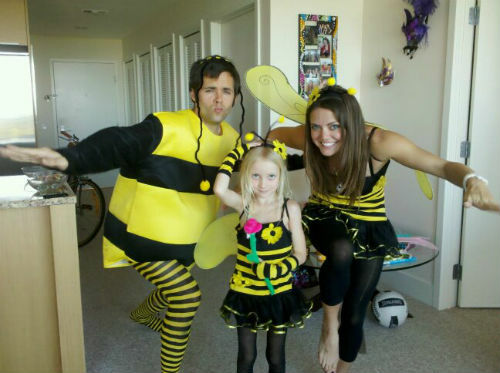 Why Are You Dressing Up Like A Bumble Bee Jonathan? Answer: because my niece just visited me, and we got to spend the whole week together. 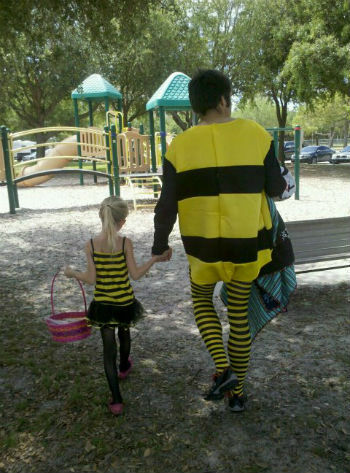 Which naturally includes dressing up like a bumble bee. Duh! Alice is 7 years old, super sweet, and we had a great time baking cookies, playing hide and seek, and dressing up like bees. If you haven’t tried any of the above, do yourself a favor and give it a shot. You’re missing out! 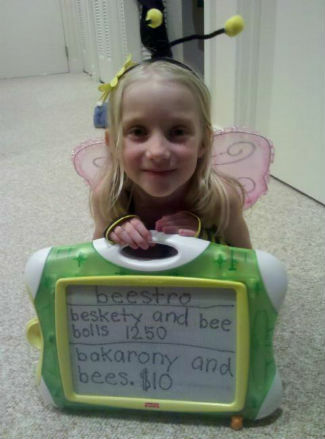 What’s It Like Dressing Up Like A Bumble Bee? It feels more natural than you’d think. The only uncomfortable part is when your tights start to chaffe after 2+ hours. 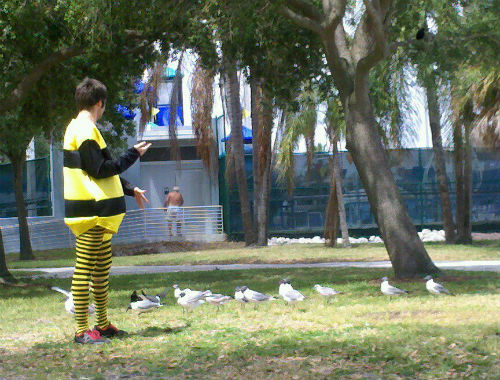 Do People Look At You Funny When You Dress Up Like A Bumble Bee? It depends on how close you are to the little kid. If it can easily be seen that you’re with a little kid and they want you to do it, you’re adorable. Especially with women (take note guys). The story changes if the two of you are further apart. Alice and I went to the park to play hide and go seek with my sister, but she eventually got tired and wanted to eat. Not so adorable if you're on your own....CREEP! So I was on my own in a bumble bee costume playing hide and go seek with a bunch of little kids. Nobody was amused. Next Post Milk Thistle: An Herb That Stops Cancer and Cures Hangovers! I look forward to the berry powder 🙂 And I think smaller sizes are a good idea. Also, thank you for the nice thank you note you sent after I bought Incredible Greens. That was really nice. Thanks Robyn. I’m glad you liked the card! Before I started the company my goal was to send a handwritten thank you card to the first 1,000 customers. So far so good….. The berries powder will probably be the next thing to come out. It was planned from the outset, and there’s already a recipe/process in order for it, but we just wanted to make sure certain processes were in place and establish a customer base first. Packets are a little more difficult because they’re very labor intensive and require more upfront investment. They seem to be popular though, and I’m thinking (hoping) that’ll be a reality within the next 6 months to a year. IS INCREDIBLE GREENS SOLD IN CANADA? Hi Jackie, currently no it’s not.